It was a busy day with lots of action. Let's see, Mike (our electrician) was back today finishing up the power shutoff under the hood (in case the fire suppression system kicks in). 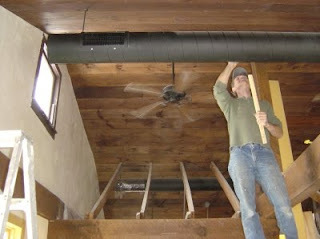 Jeff (our plumber and A/C meister) was here as well installing the registers in the A/C duct. Jeff (our insurance agent) stopped by to talk to us about future insurance coverage for the building, liquor liability, general liability, and what-have-you-not insurance one needs or should have, if one were to run a restaurant. I have never mentioned Jeff, but he is a loyal follower of this blog, which I normally get reminded of when he shows up or calls, like after we had taken down the cottage (remember the cottage? ), and he called to let us know that he was adjusting our insurance accordingly (now that's customer service!). E! 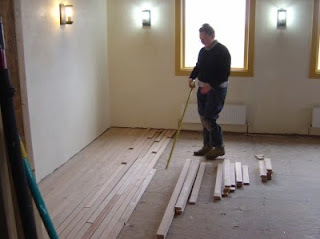 was busy lining up wood planks for the big day tomorrow, when she and her friend Sarah and maybe our neighbor Julie will install the hardwood floor in the beer hall. Much thanks go to Mike (for lending us his floor nailer), and Jack (for lending us his compressor). 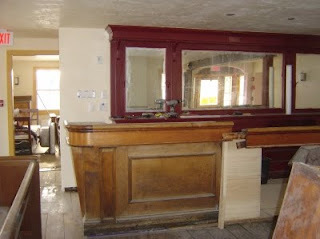 At long last I installed the first piece of the bar. It was the easiest piece, but it gets my mind focused. OMG the place is looking gorgeous. I can taste those pretzels right now. Maybe the semi sweet chocolate? Will they be green for St. Patty's Day?